Sidewalk chalk is one of those marvelous summery entertainments for kids that costs very little and has great educational value. Here's a list of 10 fun ideas we love to squeeze the amusement from your tub of sidewalk chalk. 1. Yeah, normally a 'chalk outline' of a body is a bad thing. But your preschooler doesn't need to know that. Trace his outline on the sidewalk and then let him color it in. 2. Draw a flower garden. I particularly like this one, since if it doesn't rain for a few days my chalk flowers last a lot longer than real flowers I might attempt to plant. 3. Make a color wheel. What better way to start to introduce the differences in the colors to your child? 4. Draw a prarie dog colony, and once your tunnels are established, race your stuffed animals from burrow to burrow. 5. Likewise, draw a small city, and use matchbox cars to maneuver from one side of town to the other. 6. Write out the alphabet in large letters, and then have your child call out simple words like "CAT". Spell the word for your child, having him run to each letter as it's said. 7. Draw some trails of animal tracks (horse, cat, bear). 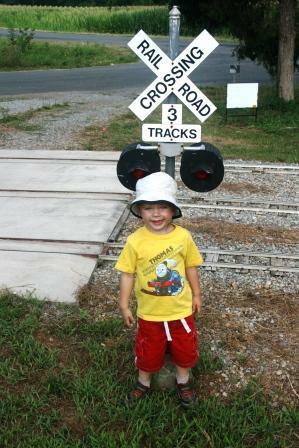 Have your child act out the animal as he follows the tracks. 8. Draw different rooms and play house. 9. Draw a maze. Have kids race to see who can go through the fastest. Have older children try to navigate backwards. 10. Instead of normal hopscotch, draw a river with scattered stones and logs. Have your child practice jumping from stone to stone without touching the water. If he touches the water, he has to go back to the start. Memory Lane Friday is a time to preserve your memories for your family. 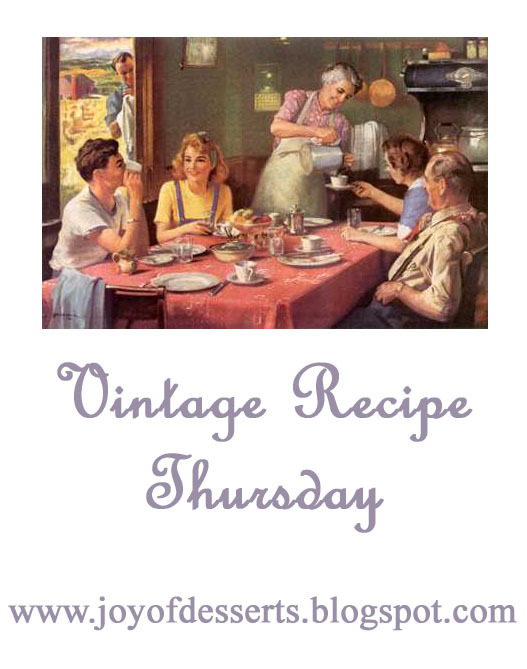 Each week is a different topic, but you are always welcome to write on any topic and link up. This week's topic is 'Chore Time'. It's no lie that I have always hated doing the dishes. My chore growing up involved the dishwasher, and I hated it because food, post-eating, has always grossed me out. I'd much rather muck horse stalls or clean and dress a gangrenous fetlock. But I'm not going to write about the dishwasher this time. Not really. Instead, I'm going to write about my parents' bright idea when I was about 10. We lived next door to an elderly widow that all the neighborhood kids called Aunt Pearl. She was really sweet and I enjoyed visiting with her. One day, though, my parents got this great idea that I should go trim the grass around Aunt Pearl's chain link fence. And when they informed me of this great decision, I was informed in such a way that I knew it wasn't optional. The thing was, it was HUGE chunks of grass. Now this would've been no big deal. If we owned a weed wacker. Which we didn't. Nope. What we had were rusty Edward Scissorhands-esque grass clippers. By the time I finished, I was done for! My back was all cramped, my thighs were sore from squating so long, and my hands were shredded. Aunt Pearl sure was pleased though, and gave me $2 for my all-day ripper-fest. Looking back, it was one of those character-building experiences that kids hate and adults love. Pretty sure my boys will have a few of those in their future - but hopefully without the blisters! Want to participate in Memory Lane Friday? Grab the code below the button and copy/paste it into your blog. As promised Mister Linky is getting the boot. There are a couple of options, so this week I'm trying inlinkz. Hopefully it'll go smoother than the past few weeks have. So add your link and pic in and let's try it out! Little chick Horace, taken last February. Well, Horace grew up. As did our other chicks. And we waited. And waited and waited. 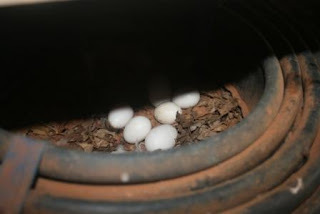 The eggs start out quite small, and get larger over time. 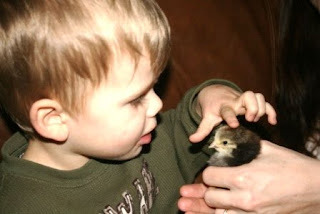 In the beginning, they might only lay 1 egg every few days, but over time, they begin to lay almost every day. 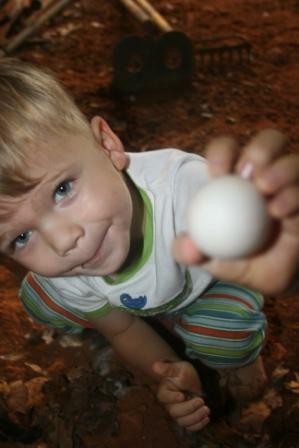 Eggs from free range chickens are richer in nutrients than those from confined chickens. The yolks of our eggs are the deepest, richest yellow I've ever seen. 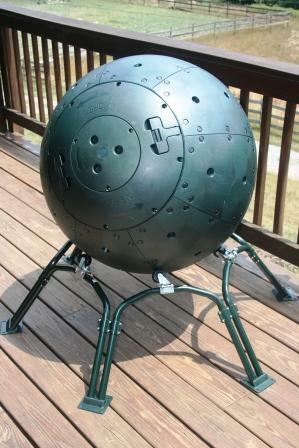 For Father's Day this year we got Paul this extraterrestrial ecomposter. We used to have a compost bin that Paul built. So we were overdue for a new one. Ratings on this were slightly negative because it was a real pita to put together. But I knew the family handyman couldn't be thwarted by assembly. Sure enough, it took a little time but he had no trouble constructing our ecomposter. Now I figure next time Pierce throws a tantrum I can just beam him up through our backyard compost bin. I was at Hollywood Video the other night because they are closing down, and movies are 60% off. Which makes core movies a mere $3.99 so I figured I might as well stock up. So I'm at the checkout and the guy ringing me up is probably in his early 20s, tousled hair, glazed eyes and adament boredom. This guy is so obviously offended by my even being present in the store that he can't waste the time to notice I exist. The most remarkable thing, though, is his t-shirt. Specifically it says "Zombie Response Unit" with weapons, blood stains, and the words "Locate, Decapitate, Incinerate". Now come on. You see a shirt like this, you get a little intrigued, right? So I say, "That's an interesting shirt" and he immediately perks up. "Yeah, I bought this for Zombie Awareness Month!" Oh? Zombie Awareness Month, eh? I must've missed that 5K. Having recently viewed the film Zombieland, on the recommendation of Hayley at Gone With the Twins, I now consider myself meagerly knowledgeable of zombies. 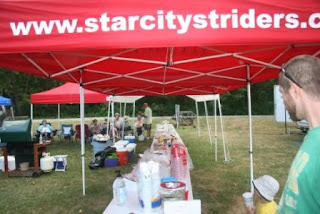 Plus, I frequent the site Zombierunner.com, where you can stock up on all your ultrarunning needs. So I throw him a crumb of zombie knowledge. "There's this website called Zombierunner.com for runners. They have t-shirts that say Zombies are were people too." My new zombie task force friend says, "Oh that's so cool. I'm gonna check that out man. During Zombie Awareness Month everyone wore gray ribbons all month". I am just so clueless. Here I made it through the ENTIRE month of May and didn't even NOTICE that I was surrounded by people wearing gray ribbons for the cause. How could this happen? According to zombieresearch.org, the gray ribbon signifies undead shadows that lurk behind our modern light of day. Now I know, and so do you. SO MARK YOUR CALENDARS FOLKS! Knowledge is power, and next May we'll be wearing our gray ribbons and sporting our own "What you don't know can eat you" t-shirts. You won't want to miss it! This week Pierce got a lot of goodness from the garden, thanks to our neighbors, J.P. and Joe. 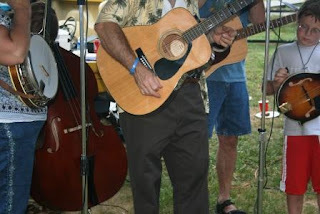 You can check out J.P.'s blog here. I am so envious of their garden, and thankful they like to share! 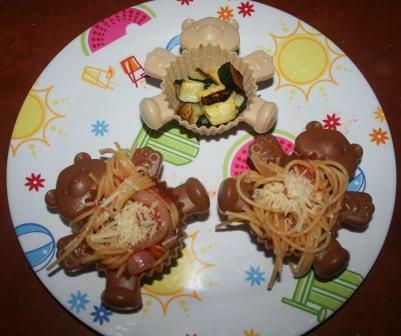 Pierce had roasted zucchini and squash. Angel hair pasta in a homemade sauce - garlic, onions, olive oil, chopped tomatoes and basil. 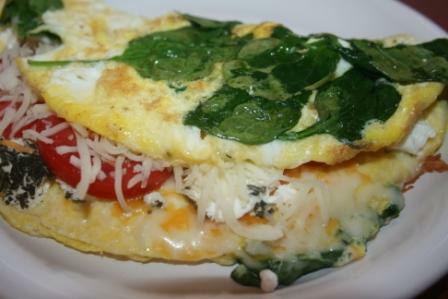 Topped with a little parmesan. He ate it up. How could he not? Gotta love those fresh summer veggies! Want to participate in Muffin Tin Monday? I Scream, You Scream, We all Scream for MORE Ice Cream! You know what irritates me? The fact that one serving of ice cream is 1/2 cup. Does that seem like a serving to you? 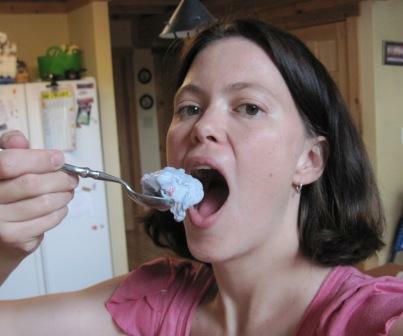 Do you know anyone who only eats 1/2 cup of ice cream at a time? Talk about an unjust world. If you fix yourself a bowl of ice cream - well, 1/2 cup is like ONE really big bite. I move that ice cream servings should be at least 1 cup. Yeah, that means that we'd all be getting more calories per serving. But hello, none of us were only eating 1/2 cup to begin with. Get with reality ice cream serving sizers! A serving of ice cream in the Real World doesn't limit itself to a measly cup. 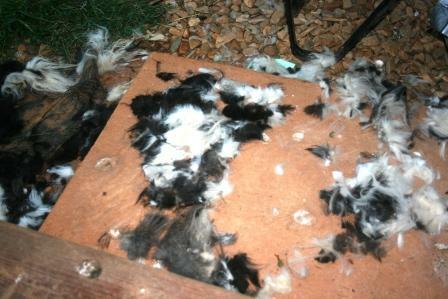 When a friend stopped by the other day he caught sight of this and asked if a skunk had exploded on our porch. 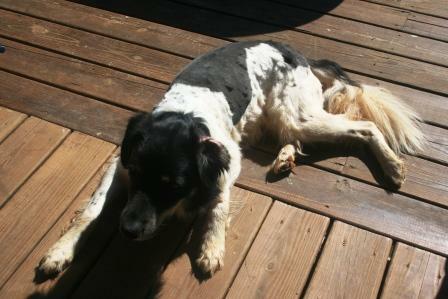 Somebody got a summer hair cut. Sadly, it wasn't Paul's beard. Scooter feels much better now though. His long border collie fur was starting to form dreads from all the trips he makes in and out of our creek all day to stay cool. Dreads can lead to mats which lead to hot spots. If you've ever had a dog go through hot spots, you know how unpleasant they can be. So I decided to shave him. Memory Lane Friday - That Was a First! 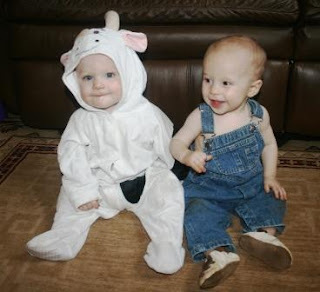 Memory Lane Friday is a time to preserve your memories for your family through blogging. Each week is a different topic, although you can blog about any memory and link up. This week's suggested topic is "That Was a First". When I first started horseback riding lessons I was seven. I had a pony named Shorty and took trail riding lessons. I rode western. 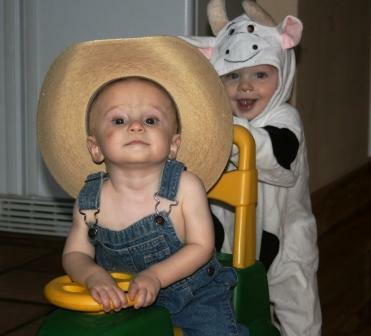 By the time I was 8 we had moved, and I started riding Saddlebreds and Tennessee Walkers. I had my first horse show, which will undoubtedly be discussed in some future post. At any rate, we moved again and I met my friend Chelsea in Roanoke. Chelsea rode hunters/jumpers. And I started begging. 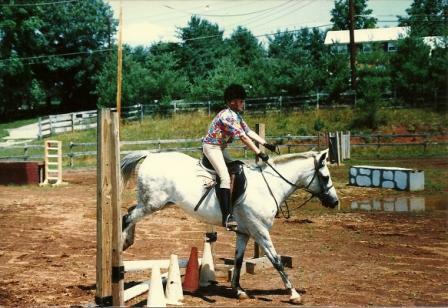 At some point, my parents relented and switched me to a riding facility that taught hunters. Did I almost fly off the back of him or what? You can participate in Memory Lane Friday by grabbing the code below the button and copy/pasting it into your blog post. This is my last shot w/ Mister Linky. If he doesn't work out this week, I promise we'll use something different next Friday! Come back next week! The topic is "Chore Time". Don't even tell me you don't like tomatoes! I know that there are people out there who exist that don't like veggies. So sad. Me? My absolute favorite part of summer is the veggies. Sweet corn on the cob, grilled. Fresh green beans with baby potatoes. Zucchini cakes hot from the skillet. But the veggie of all veggies is....a fruit! I love tomatoes. I know they're really a fruit, but I don't think of them that way since they aren't exactly sweet. Rich in Vitamin C and antioxidants, they are healthy too. I could eat mine straight off the vine with just a little salt. Pierce likes them this way too. Layered in omelets with spinach and goat cheese. Oh drool. Baked in a pie with herbs and grated parmesan. Sauteed with garlic and olive oil and tossed over pasta. In a lime vinegrette with black beans. 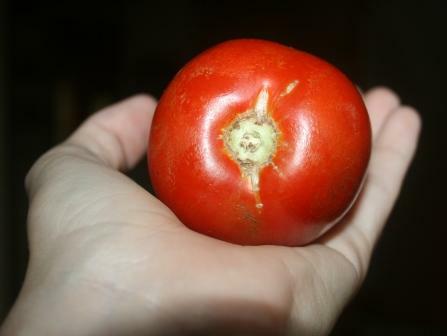 Or a really ripe, warm tomato on a grilled cheese. I never get sick of tomato season. The only downfall is it passes way too quick. 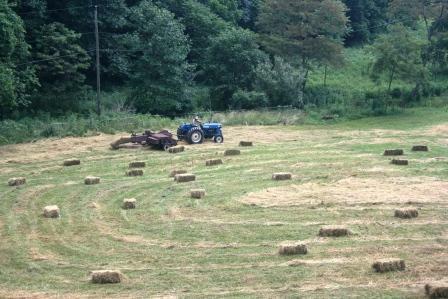 Recently we got up our hay. 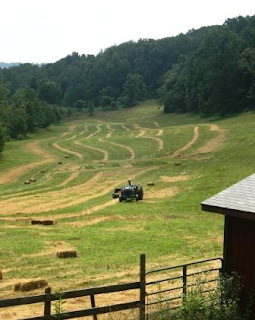 This is one of the only things we do that makes us a true farm, as we do sell the hay. Let me just say, I can't think of many things worse than getting up hay. First, it's always about 95* and humid as all-get-out the day the bales are prime for pickup. And of course, because hay is itchy, you can't just wear a little tank top and shorts. 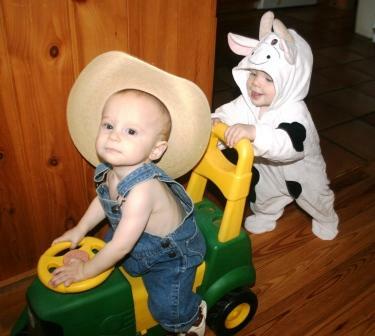 There's a reason farmers wear bibs! To keep out the itchies from hay, to protect against chiggers and ticks. So you've got long sleeves on and long pants, and sometimes a hat to protect from the sun. And did I mention it's 95*?!?!? So you walk through the pasture picking up bales while someone drives the truck alongside. Or else if you don't have any help, you drive the truck 10 feet, stop, pick up a bale, toss it on the back, then drive another 10 feet. And so forth. One year, the bales were really dense because we cut late and had a very moist spring. Those bales were so heavy that I was sore for days afterwards. I could hardly lift them, much less toss them on the back of the truck. 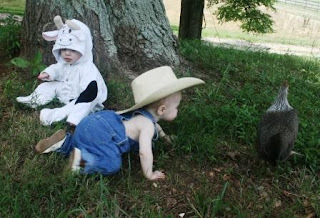 However, since I had the boys, I have gotten out of my hay duties. Someone has to watch the boys! That person is me. And every year, come hay baling time, I'm so eternally grateful to be inside wrangling children instead of hay bales, basking in the a/c. So grateful I'm all, "Pierce could I make you some cupcakes? Perhaps I could buy you a new bike?" All too soon, the boys will be old enough to at least walk along with the truck as I return to the fields to bale hay again. But until that day comes, I'm thankful for my all-to-brief hay hiatis. During the 4 1/2 years I spent working juvenile probation, I was very aware of the prevalence of "mean girls" in the community. I focused my work on females (no one else in the office wanted to deal with them; my coworkers stating they were too dramatic, so my boss was more than happy to give me the female cases). I can't tell you how many times I had a girl in my office crying or ranting over the bullies at school. I was constantly listening to stories of a group of girls "banking" (slang for beating up) one another. It's CRAZY out there. But until last week I'd never witnessed one of these incidents first hand - except in the movies. Last Tuesday we went to the All Comers track meet again. This is open to anyone and everyone in the community who'd like to come out and run. It's a family friendly event, and indeed, large groups of families show up. All kids who run get medals (but adults run too). We arrived early so I could do my usual track workout (which I do every Tuesday). It poured rain, so I had that whole drowned rat thing going on by the time All Comers rolled around. Even though there were lots of people, I noticed MeanGirl right away. She was strutting around in black capri tights and a form fitted white tank top. Stick thin, there was no doubt that she could pull off this outfit. Long, rich brown hair swung with panache in her pony tail, tied neatly with a large white bow. She wore full makeup, even though it was a hot and steamy day. I also noticed another girl right away. Let's call her NiceGirl. She was gangly and had a small pot belly, sporty unruly curls and she wore an ill-fitted hot pink tank top and a white running skirt. A sprinkling of acne dotted her t-zone. Her stride, as she jogged around, was just slightly clumsy, as though she'd just had a growth spurt and hadn't quite adjusted yet. Both girls ran the 800, a two lap event around the track, with a large number of males. The girls were in a pack of about 5 individuals who seemed to stick together in like pace. Things seemed to be going just fine until the back corner of the last lap. Suddenly, MeanGirl took off. NiceGirl had been ahead of her, on the inside. MeanGirl, who was behind, suddenly SHOVED NiceGirl with both hands. And I do mean SHOVED. I watched in shock as she then passed on the inside (a big no-no in track events). I turned to look at two of my fellow Striders members who'd been watching this play out. "YES! And at an All Comers meet too!" MeanGirl was pulled aside by an older man who was on that end of the track, and he talked to her for some 15 minutes. I don't know who this guy was, but I can only hope she was getting one heck of a lecture about her etiquette. Seriously, it was all I could do as she sashayed past not to make a comment myself. What ever happened to kindness? It's Muffin Tin Monday again! This time we decided to put some of the items we got from Sweet Brown Sugars in our blog swap to good use. 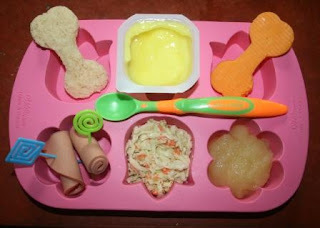 Pierce had a "not together" sandwich in his dog bone shaped bread, cheese, and rolled bologna. He also had lemon pudding, applesauce, and homemade cole slaw. He ate everything but the cole slaw. For whatever reason, he absolutely will not touch things like salad or slaw. I keep trying though. Now, I need your help! Please vote (there is a survey on my side bar) for your favorite picture. Chick Fil A is having a photo contest with various prizes. 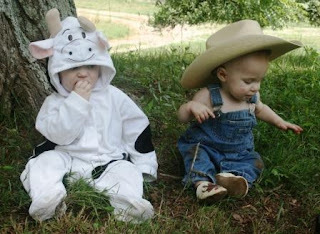 The only rule is you have to dress as a cow. Which picture should I send them? For a few weeks now I've been biding my time, casually thinking about RSS feeds. I didn't have one you see. And for some reason, I found the idea of an RSS feed a little intimidating. Why? I don't know. Maybe they should have a friendlier name for it. Like a Friendly Reader Feed (FRF)? What is an RSS feed, you ask? It stands for Really Simple Syndication (I had to look this up). It's just a way to read all the blogs/webpages you like in one place. Obviously, Blogger makes it easy to read all the Blogger blogs on your dashboard. But what about those blogs that aren't on Blogger? Those elite WordPressers (and otherwise). I had quite a few that I enjoy under my favorites (Kath Eats, Pioneer Woman, and of course Warren's Home Among the Hills). And I would have to click on each one under my favorites to go to the website. With an RSS feed, you can have everything in one place. How can you do this? Well, from Blogger, just click on My Account and you can go set up Google Reader. Once you're set up, all you have to do is click on the little orange stripey button to 'subscribe' on blogs or webpages you like. Once you're subscribed, your reader will update any new posts as they are there. This will save you precious time so that you can spend even MORE time everyday reading MORE blogs and blogging MORE. Now, if only Blogger could make some smileys, my life would be complete. So back in May this year, four teenagers in NY were driving and decided to have a contest. They were trying to hold their breath until they passed Garbutt. Unfortunately, the driver - 19 year old Bryan Parslow, passed out. I'm not sure how you could hold your breath so long you passed out. I guess I'm just too wimpy to pull that one off. Anyhow, when Bryan passed out the car ran off the road and into a tree and boulder. Fortunately, although all four teens were injured, their injuries were mild. And they are all breathing again. What's funny about this story is that as stupid as it sounds, we used to always do the "holding your breath" game on road trips. My Dad would be all, "I'm going to hold my breath until we get to South Carolina!" Oh, and one of our favorites? I could never hold my breath that long, but my Dad always could. And, fortunately for us, he never passed out either! Memory Lane Friday is a weekly opportunity to blog about your memories, to preserve them for your family. Each week is a different theme, but you are welcome to blog about any memory you'd like and link up. This week's theme is 'A Tourist Trap'. When I was 9 years old, my Dad came home from work one Friday and told us to pack our bags! He was surprising us with a little road trip. It was so exciting as we tossed our cold weather gear into duffles and piled into the car. We didn't even know where we were going (my dad wouldn't tell us), but we knew we'd have some fun. We ended up in Gatlinburg. 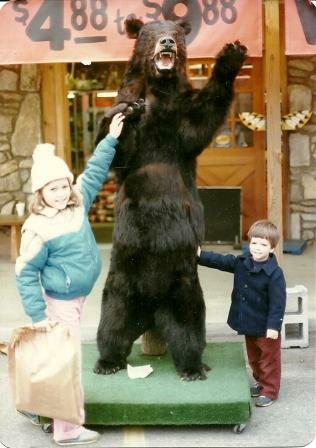 Gatlinburg is a haven in the Great Smokies. It's a gorgeous piece of the mountains, but man is it ever a tourist trap. 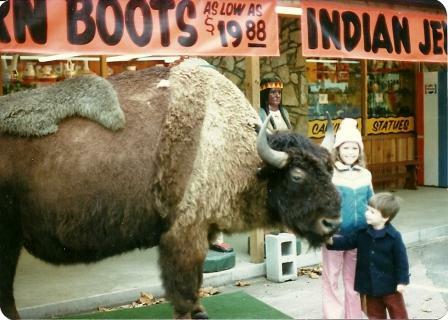 Stuffed full of quaint shops carrying homemade fudge, kettle corn, Native American wares, you will also find a plethora of shops carrying gaudy t-shirts, hats, and other appealing junk. Note the big bag I had in my hand. Wish I could remember what "treasure" I had bought with my allowance. 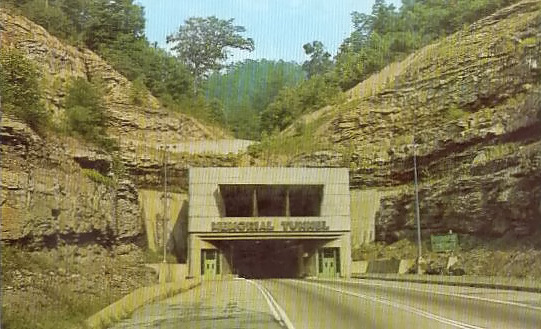 One thing I remember clearly about the trip was driving on some mountainous road, my brother Taylor perpetually carsick as usual, and being caught in a traffic jam. On the side of a mountain! Turns out the traffic jam was due to a black bear on the side of the road. All these tourists were stopped and tossing marshmallows and crackers out their car windows for the bear to eat. HELLO! Yeah, tourists can be idiots. I think we had some pictures of the bear as we crawled by safely in our car in the traffic, but I'm not sure what happened to those pictures. Want to participate in Memory Lane Friday? It's easy. Just grab the code below the button and copy/paste it into your blog. Next week's topic is "That was a first". Write about your first day of school, the first time you rode a bike, the first time you failed a test or your first roller coaster ride. There are so many good stories that can come from this topic! Note: Not sure what is wrong with Mister Linky this time. Just tried adding a new Mister Linky in, and hopefully that'll solve the issue. I may have to switch to a different link up if this continues happening! 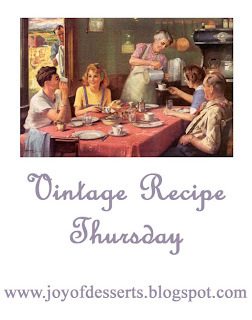 Time for another Vintage Recipe Thursday from Joy Of Desserts. As usual, I'm using my grandmother's cookbook For the Love of Cooking. This time I decided to make Peanut Butter Cream Pie. I'm ashamed to admit how much peanut butter we eat in my house. So much peanut butter, in fact, that I wish Sam's Club actually carried an extra-extra bulk sized Jif. If you are trying to eat moderately healthy, you will want to skip this one. Cream powdered sugar and 1/3 cup peanut butter until crumbly. Set aside. Combine 2/3 cup sugar, cornstarch, flour, salt, egg yolks, milk, butter, and vanilla in a saucepan or in top of double broiler over hot water. Cook over medium heat, stirring constantly, until thick. 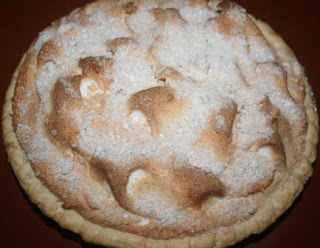 Sprinkle 2/3rds of the peanut butter mixture in bottom of baked pie shell; pour custard over this. Beat 3 egg whites with cream of tartar until stiff, gradually adding 1/4 cup sugar. Spread over custard. Sprinkle remaining crumbly mixture over meringue, bake at 350* about 20 minutes or until golden brown. Yeah, this dessert didn't go over well in my house at all (wink, wink). I love America's National Parks. I would love to visit every single one of them if I could. In particular, there are several in the Northwest I'd like to visit. So far, though, my absolute hands-down favorite has been Zion, Utah. Paul and I went there pre-kids as part of a whirlwind driving-camping trip that included the Grand Canyon, Sequoia, and Death Valley. 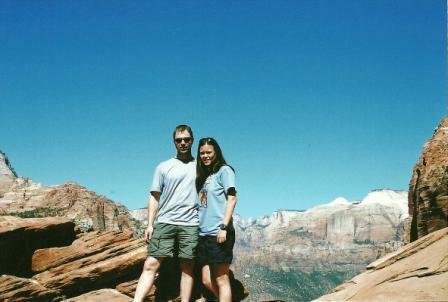 Had I known how incredibly awesome Zion is, we'd have spent more time there. Red rock, everywhere. The desert has a particular smell to it. 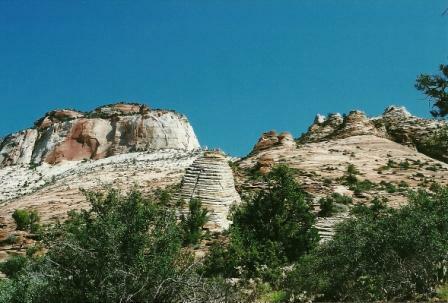 The smell of dry heat, of red rock, of sand and shrubs. 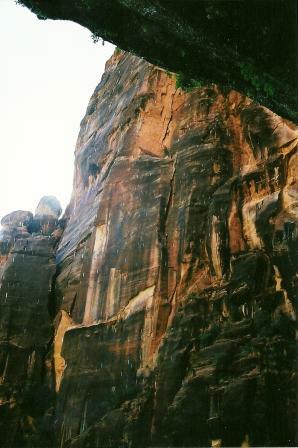 One of the biggest highlights of Zion was going to see the petroglyphs. No lie - I have probably 20 pictures of the petroglyphs. I just love them! This one shows some horned goats or antelopes, with hunters behind them. 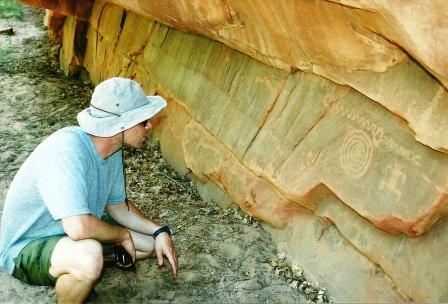 They actually keep the petroglyphs out of common knowledge as much as possible in Zion. They aren't advertised. When you go there, you won't see much about them. They don't want idiots harming them. 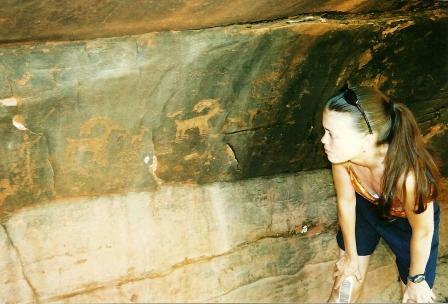 We were lucky enough to know about the petroglyphs before our trip, so that we could track them down. 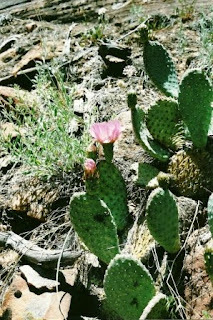 I love the exotic flowers and cacti that you find in the desert as well. I have a lot of cactus pictures! While in Zion, we had to pick and choose our hikes since we weren't there long. We did a short hike up to Weeping Rock. 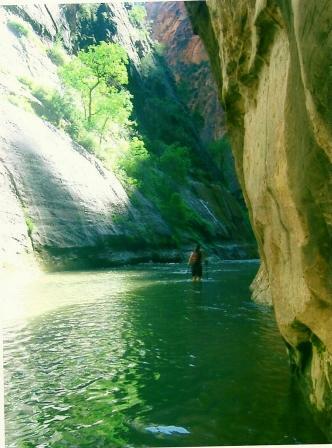 And then of course we hiked parts of The Narrows, a river bed surrounded by red canyon walls. As hot as it would get during the days, the nights would be cool. We camped in the National park, our campsite on a sheet of hard, baked red clay. When we lay down for the night the tent was stuffy, but it didn't take long for the winds to pick up and cool things off. The wind blew all night long, and as a result I slept so deeply. My hope is that one day we can return. And this time spend more time there. They actually have a marathon in this region of Utah, known to be a Boston Qualifier for the fact that it is all downhill. That sounds like it'd be really tough on the quads - but I bet the scenery would make up for it! How do Shrimp and Trains and Running go together? 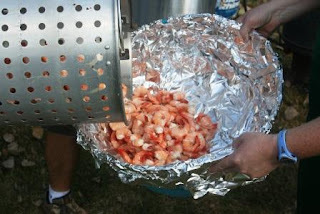 This past weekend we went to a shrimp boil that was a merging of the cultures. The train and running cultures that is. The current president of my running group, The Star City Striders, is also involved in a miniature train club. And so it was only natural that the two organizations came together for a summer shrimp boil. As much as I adore shrimp (and all things seafood), I couldn't help thinking a time or two with sadness of the oil spill. Total downer. 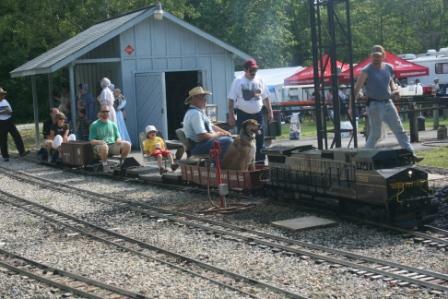 Luckily, there were mini trains running all over the place to bring back the smiles. 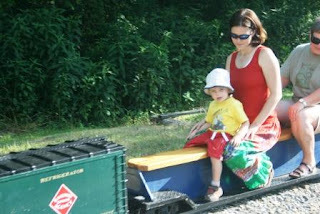 Check out Pierce in train delight. This picture just totally cracks me up. Is it just me, or is that dog up front driving and grinning from ear to ear? Paul and I took turns. Riding trains vs. Managing Grumpy Twins. Guess which one was more relaxing. I think Pierce may have had the time of his life. After riding both the trains at least 5 times each (and there was a TUNNEL in the loop for added coolness) he certainly didn't want to go home. If there's anything more exciting than riding trains for a 3 year old boy, let me know, because I haven't found it yet. It's Muffin Tin Monday again. Check out the cute muffin tin my mom found at a thrift store for us! This is a typical summer-style meal at our house. 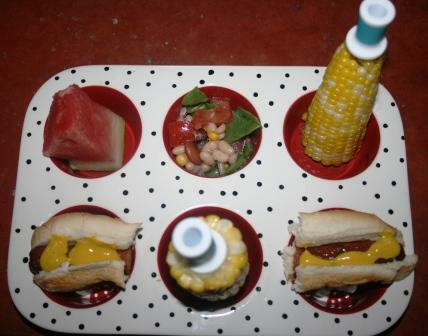 Watermelon, bean-spinach-tomato salad with a lime/olive oil vinagrette, grilled corn on the cob, and a hot dog. I think Pierce's favorite food in the whole entire world is corn on the cob. He was eating it at a very early age off the cob and never stopped. Now, just for Wendiwinn, Elvis Lives! I did not put him up there, by the way. Apparently, Elvis has decided it is his chickenly duty to be a guard bird. 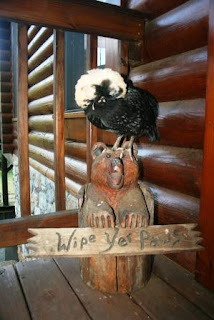 So now he perches on this bear carving by our front door. He actually sleeps there at night - I look out the door in the morning and there he is. He definitely has a way of wigging out guests, who think that he's fake until they get close. Good thing he's not prone to attack birding, huh?